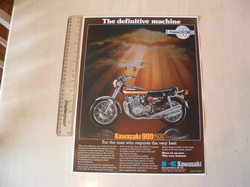 Here is the early Kawasaki Zed story in posters & brochures from the era. Click on the pictures to enlarge them. 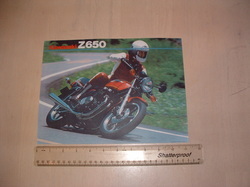 You can also download a complete Z900 brochure to keep. Any item showing a price is available for you to purchase. Combined postage & discounts are available for two or more items. Ask if you need shipping outside the UK. 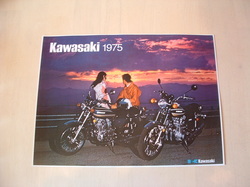 A high quality reproduction of the original 1972 Z1 sales brochure cover page. 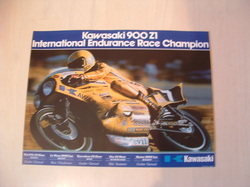 Now digitally enhanced and presented as a souvenir poster. 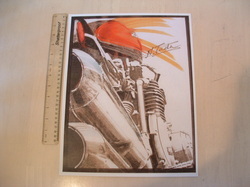 Produced on high quality silk paper. 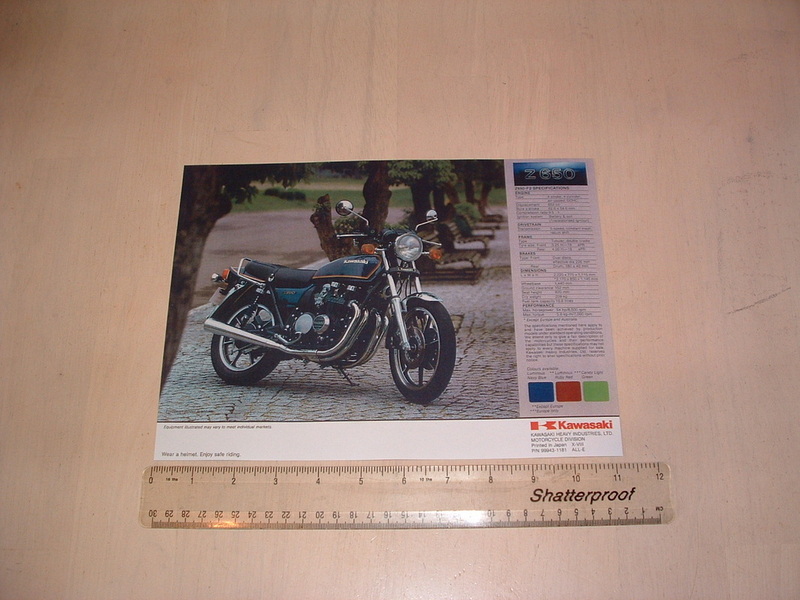 Size is just below A3 paper. 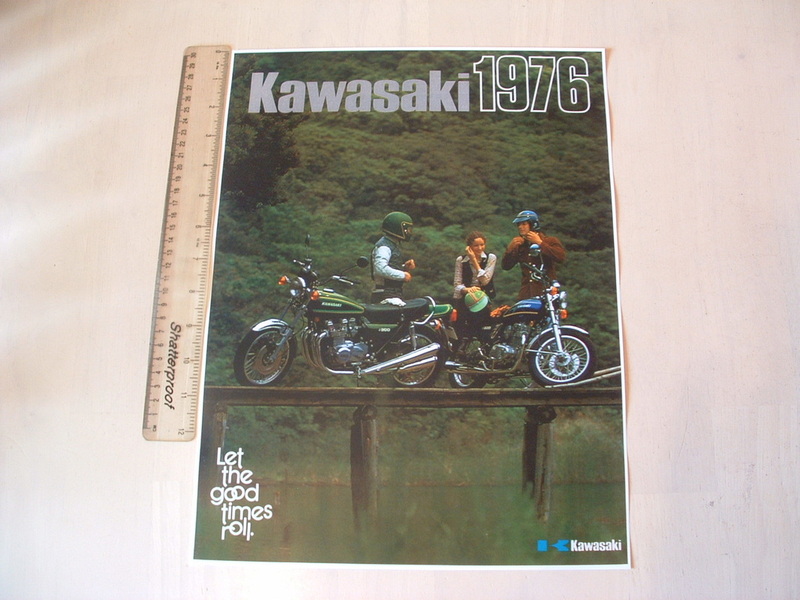 Great for the 40th Anniversary Year! 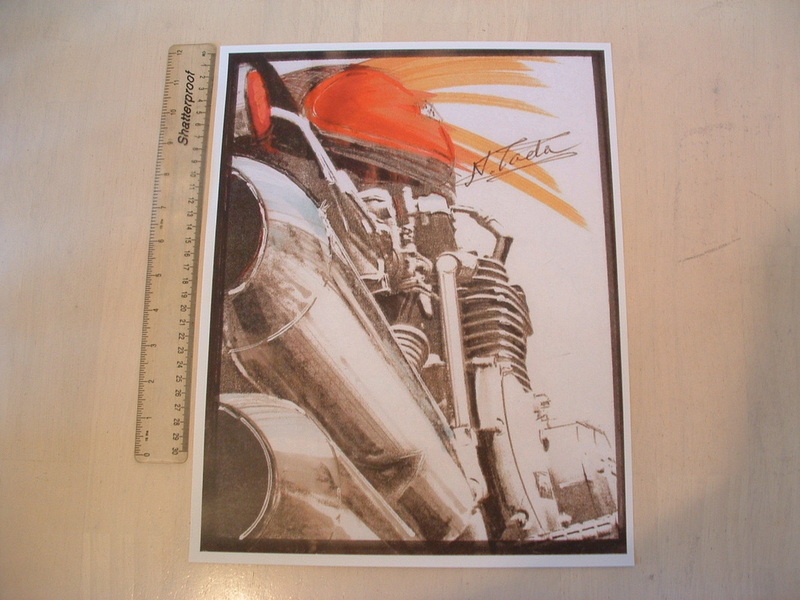 Original Z1 design team art work. 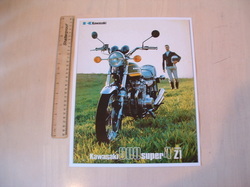 Signed by Z1 stylist Mr Norimasa "Ken" TADA. 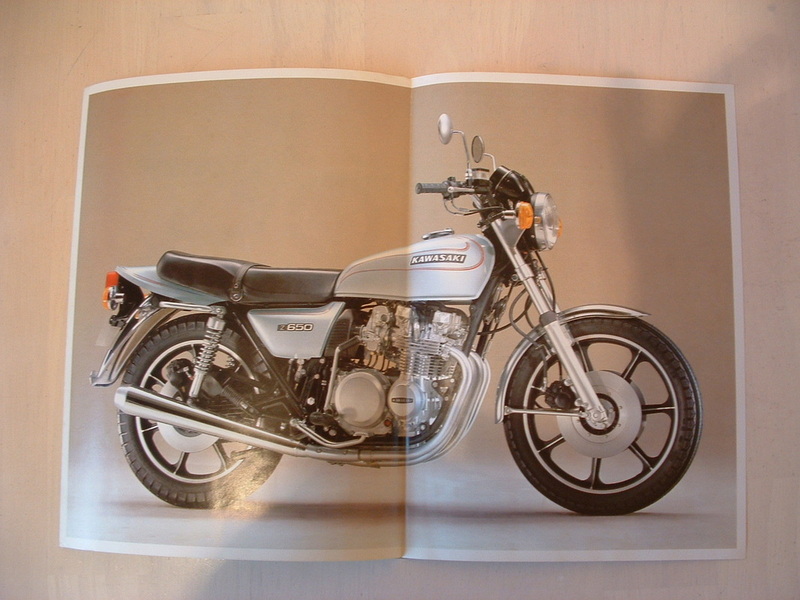 A high quality reproduction of the original 1974 Z1-A sales brochure cover page. 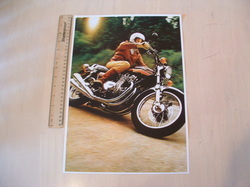 A high quality reproduction from an original 1974 factory photograph. The Z1-A is shown in action with it's new paintwork and unpainted engine. 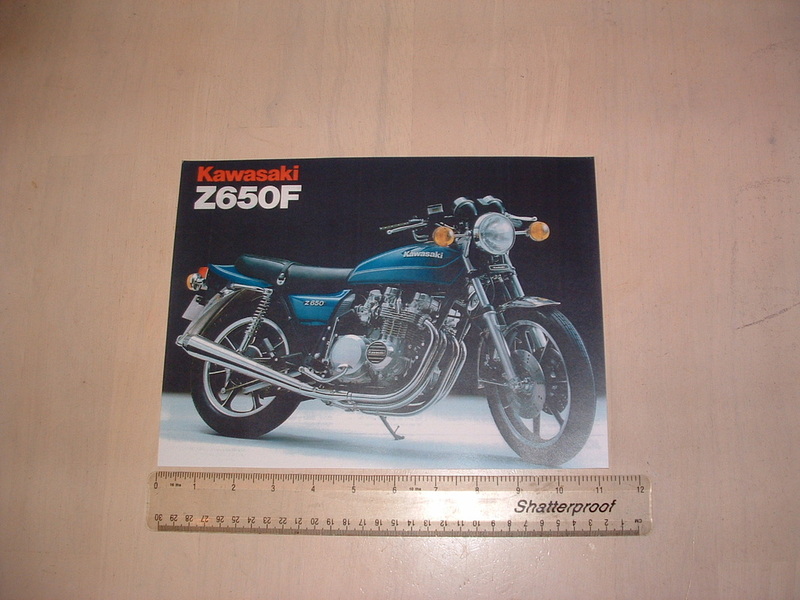 Here's where the Kawasaki Zed story really got going. 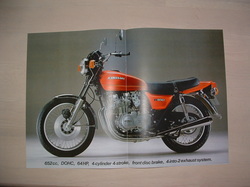 In 1972 the legendary Z1 900 Super Four machine was launched at the Cologne Motor Show to fantastic acclaim. 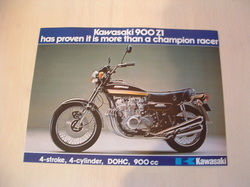 It quickly gained a reputation as the fastest production bike in the world - no mean feat as it also proved to be extremely reliable. 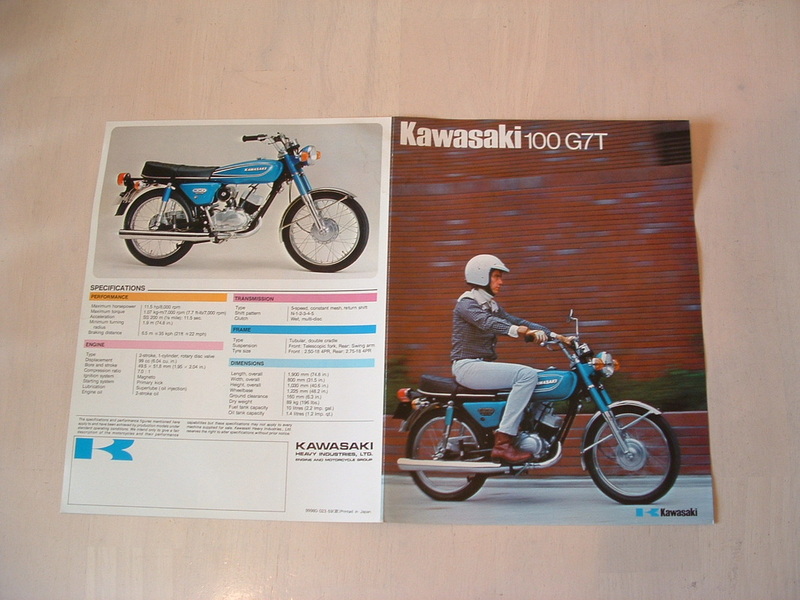 This brochure is reproduced from 1975 Z1-B publicity material. The picture above shows the front & back cover & here is the centre spread. 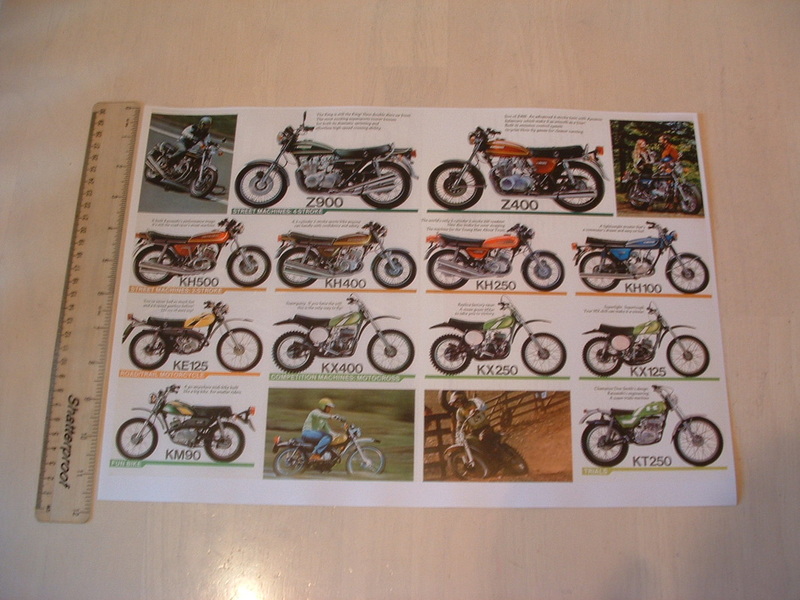 A great rebuild reference picture or poster for your garage or den. 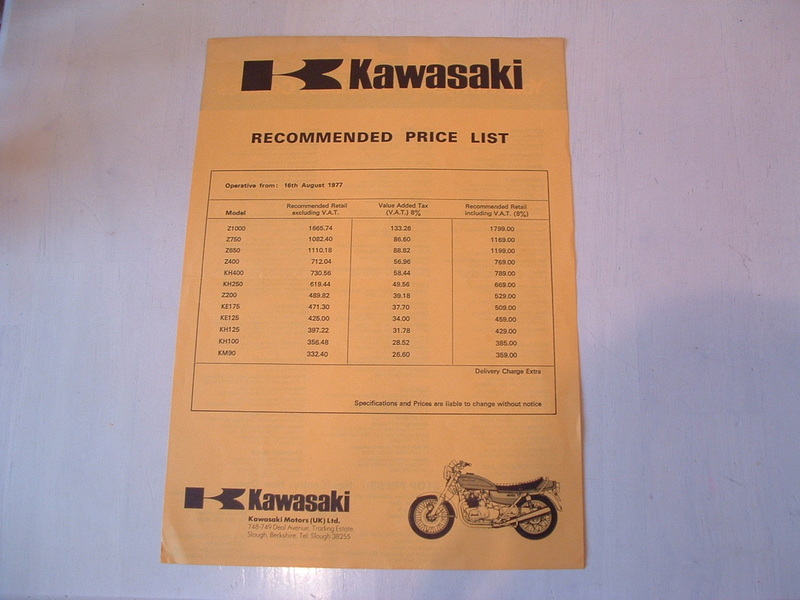 Or an ideal addition to your bike history files. In 1975 Z1 production ended with the Z1-B model.It came in Candy Super Blue, seen above, or the Candy Super Red colour scheme shown on the front of this UK brochure. Use of the new o ring drive chains allowed the chain oiler system to be removed for the first time. 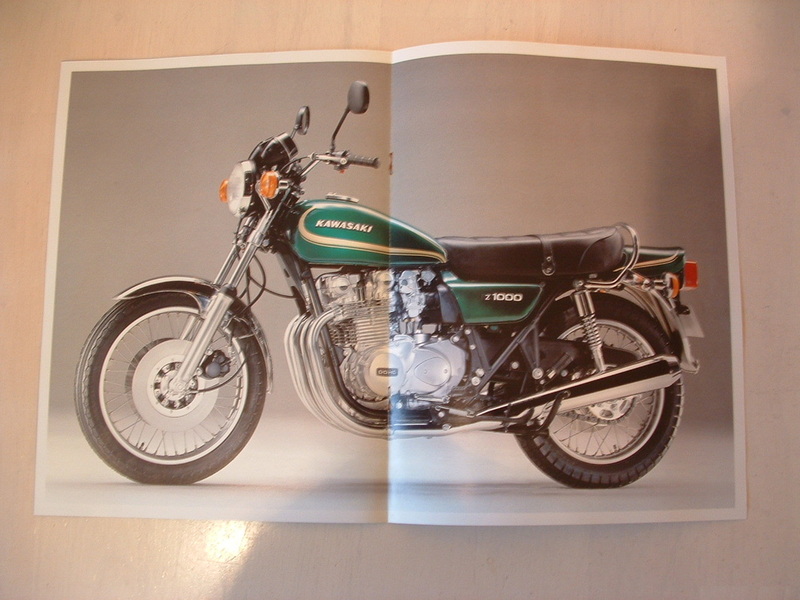 These European & UK bikes had longer rear fenders, seat straps and no reflectors on the forks or rear shocks. 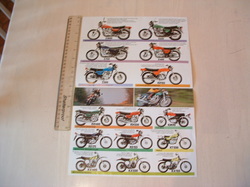 On the rear of the brochure - the Godier Genoud independent race team are shown. 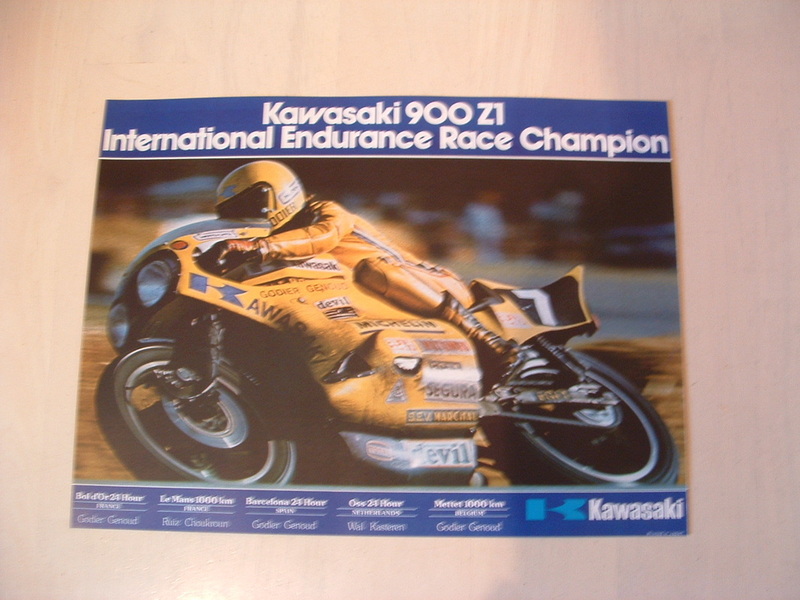 They scored great success in endurance races such as the Bol d'Or 24 hour & Le Mans 1000km and the factory was keen to capitalise on this. Reproduced on high quality silk paper. 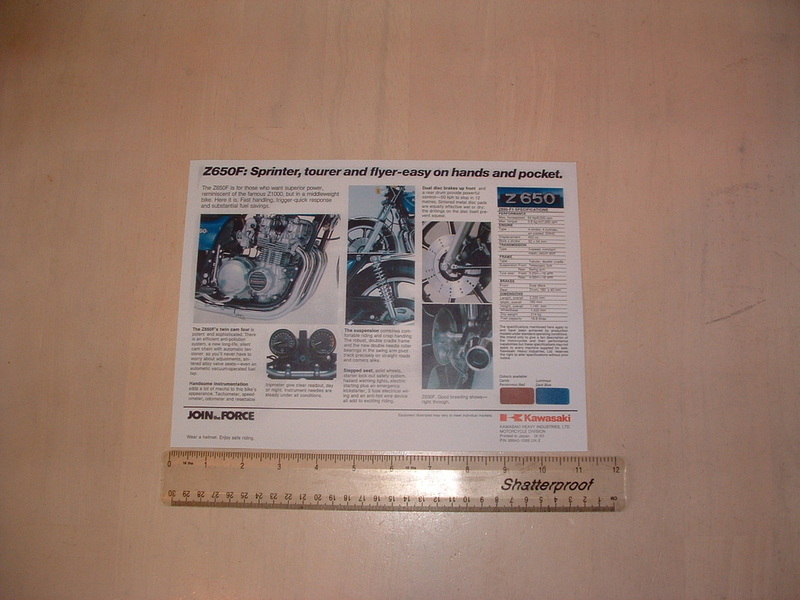 Size is just below A4 paper. "Move On Up Now This Very Summer"
This reproduced factory poster supported the campaign in the UK. 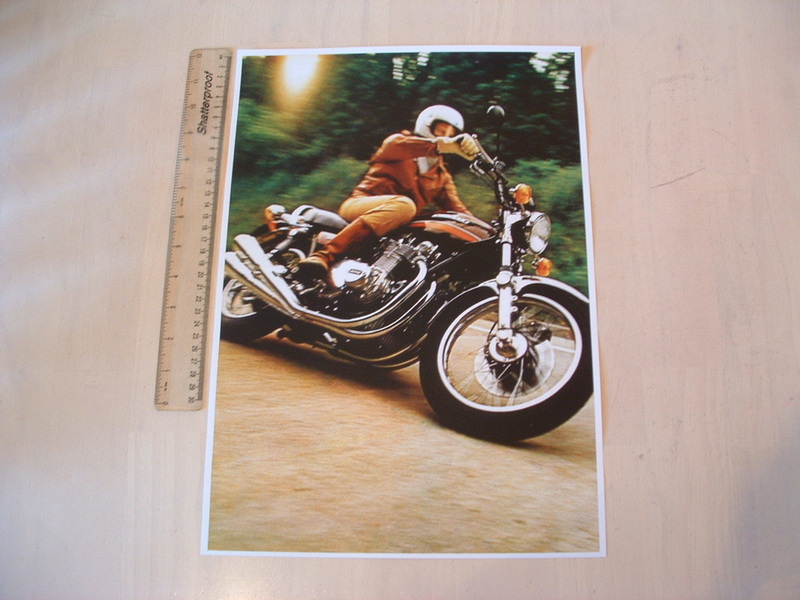 A high quality reproduction from an original 1975 factory photograph. 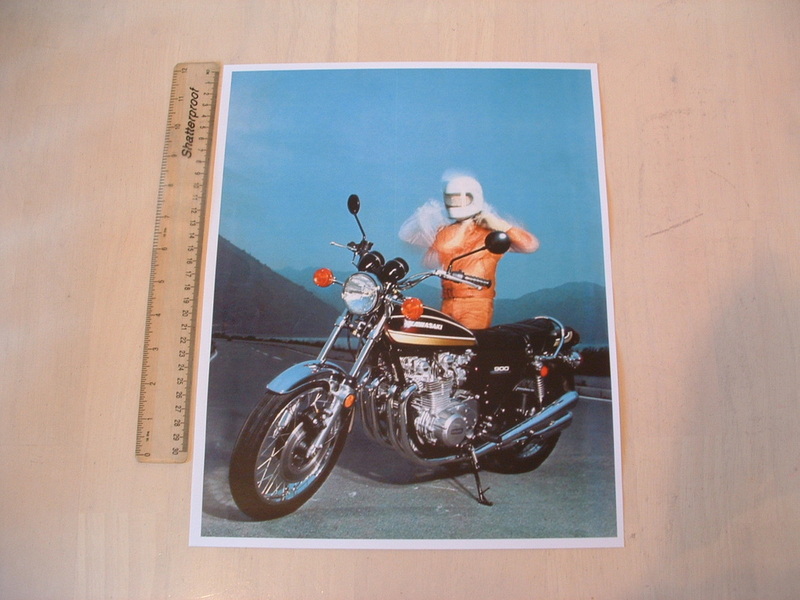 The Z1-B is shown stationary with the rider in blurred motion. 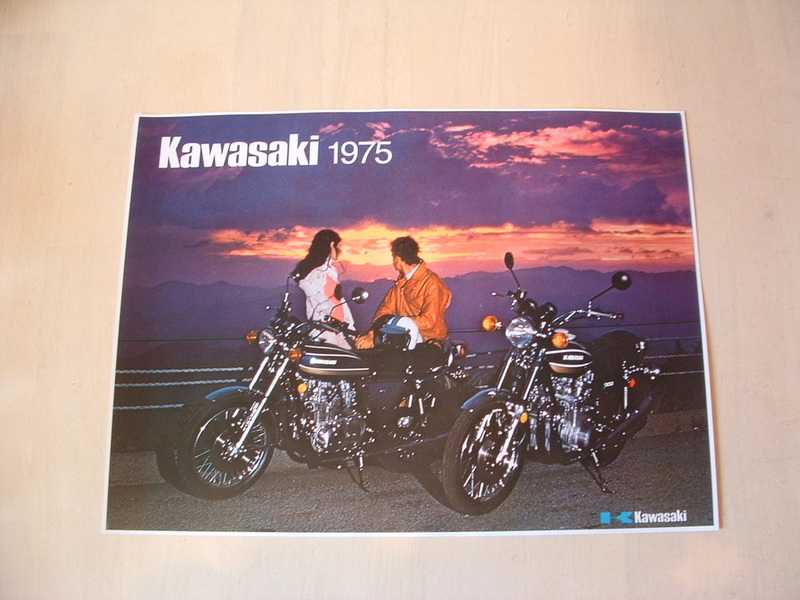 The Z1-B and Z400 are shown against a vivid sunset. 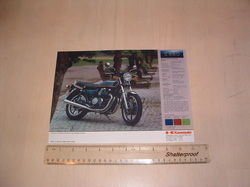 A high quality reproduction from an original 1976 factory photograph. The Z900 A4 and Z400 are shown against a cool lakeside setting. 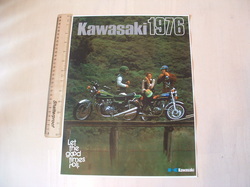 A high quality reproduction from an original 1975 factory brochure. 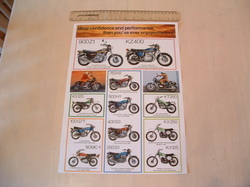 The Z1-B is shown with the full range including the H1, H2, S1 & S3 triples making their last appearance in the catalogue. 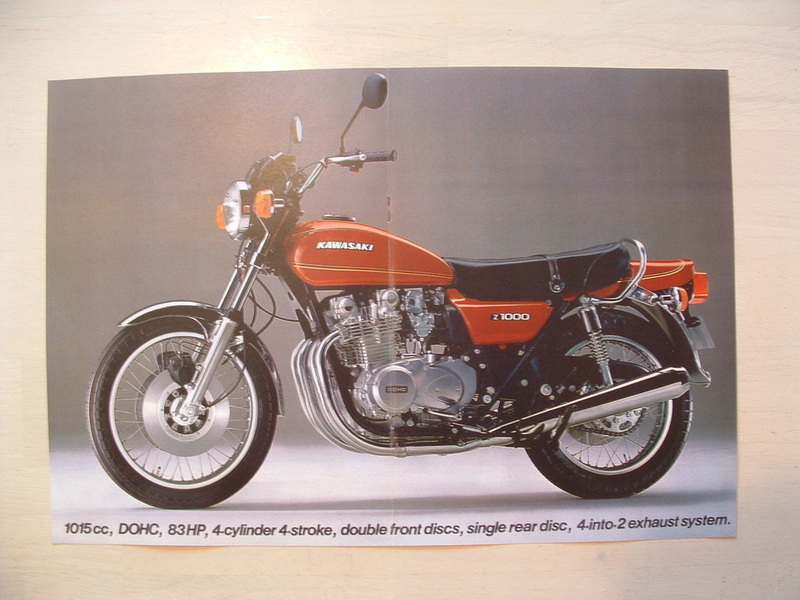 A high quality reproduction from an original 1976 factory brochure. 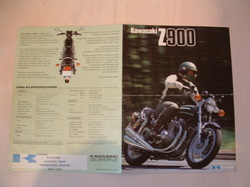 The Z900 A4 is shown with the full range including the new KH triples making their debut appearance in the catalogue. A high quality reproduction from an original 1977 factory brochure. 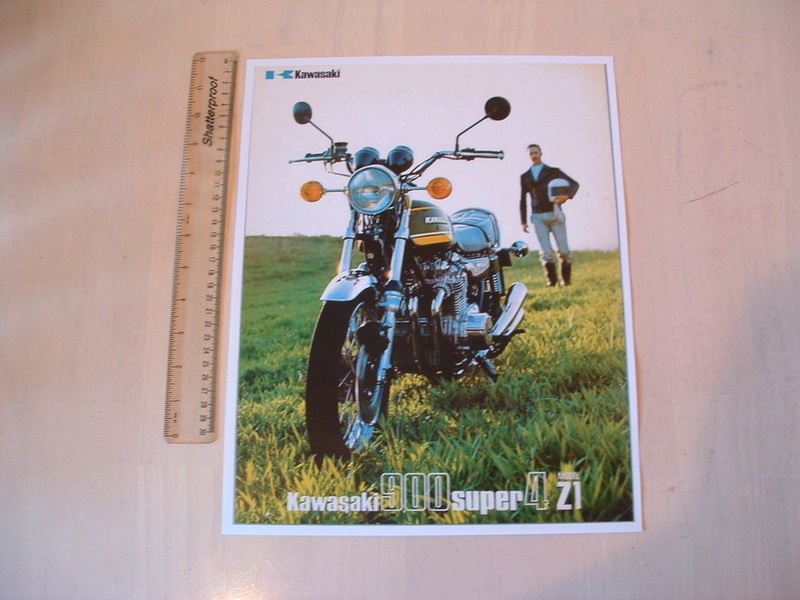 The new Z1000 A1 is shown with the full range the Z650 B1 making it's first appearance in the catalogue. 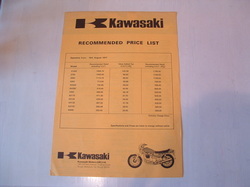 A good reproduction of the original 1977 Kawasaki UK price list. 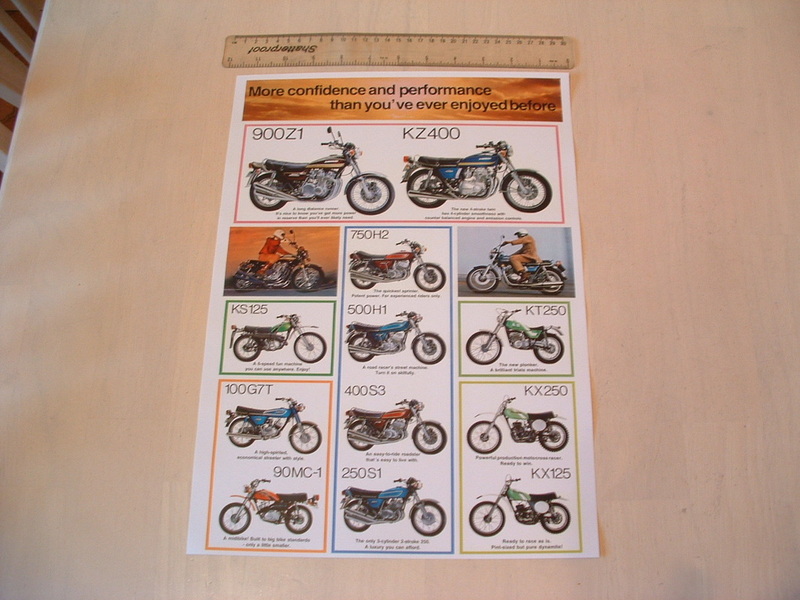 Shows the new Z1000 A1, Z650 B1 and the first of the KH Triple ranges. Produced on normal paper. 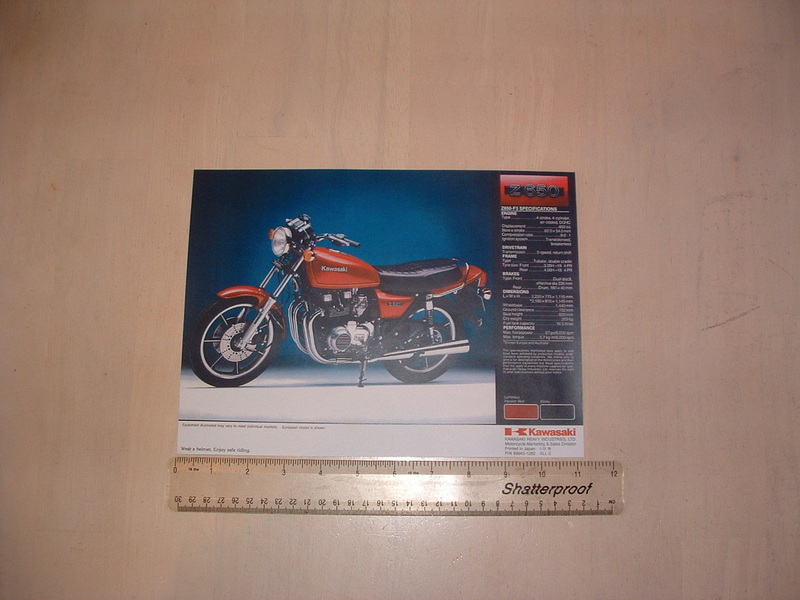 Size is just below A4 paper. Will ship this free of charge with any brochure or poster order if required. You must ask when placing your order. By 1976 the Z1 had become the new Z900 A4. Performance was not enhanced by smaller 26mm Mikuni carburettors. This was designed to improve economy and deliver a smoother mid -range performance. Added to a heavier braced frame - designed to improve handling - the result was not really seen by many as a move forward. 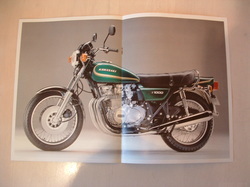 Colour schemes were more subtle with greater use of pin striping rather than the larger, bolder lines used on Z1 bikes. 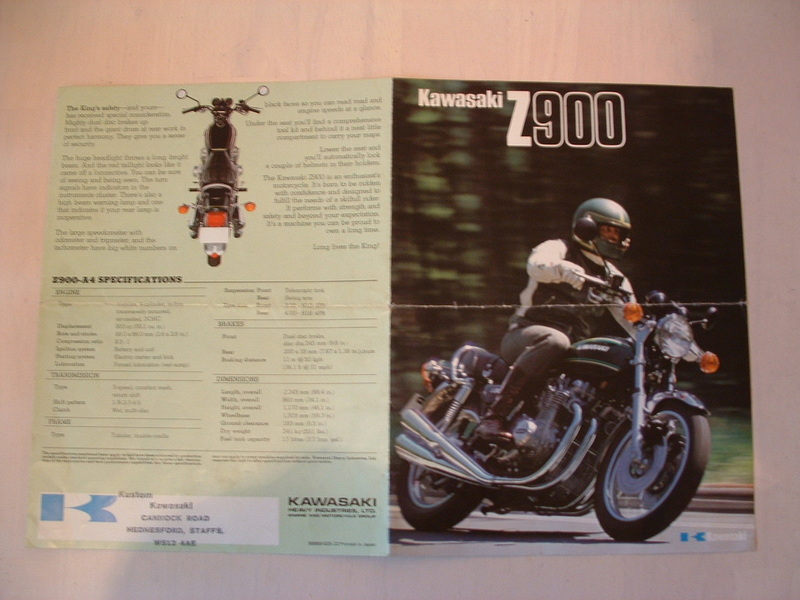 Was the Z900 the end of the line? 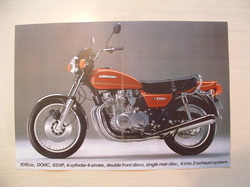 It was the last to use the iconic 4 into 4 exhaust system that had so characterised the Z1 bikes. Subtle improvements included a revised airbox to quieten the intake roar, and a new hazard switch clamped to the handlebar mounts. Some bikes were assembled in the USA during 1977 - to be known as the Z900 A5. 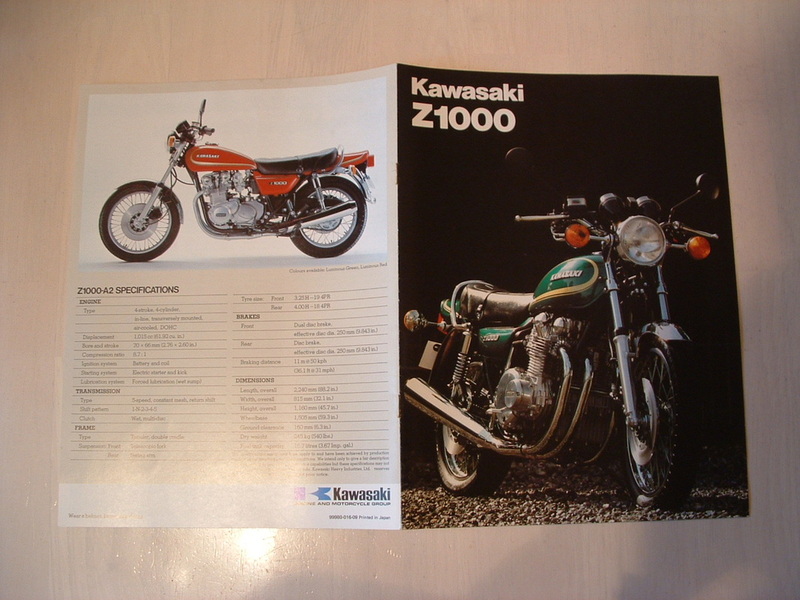 By 1976 the design team that had penned the iconic Z1 had been re-formed by Kawasaki - with a brief to translate it's success into the mid range market - at the time dominated by 750cc machines and a few left over 650 twins. 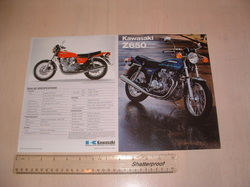 The Z650 was the result - you can see the styling from it's larger brother. One selling point was to beat current 750s on performance while reducing insurance costs. A big plus for young riders . 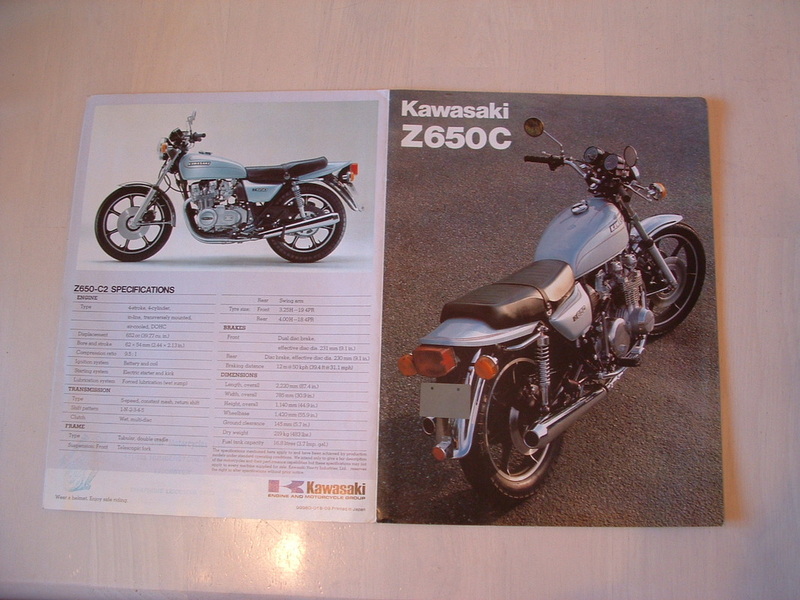 Hot on the heels of the successful launch version came the Z650 B2 in 1978.
machine of choice for newly qualified riders on a budget. 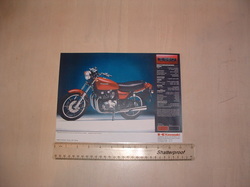 Here is something a little bit rare and different. 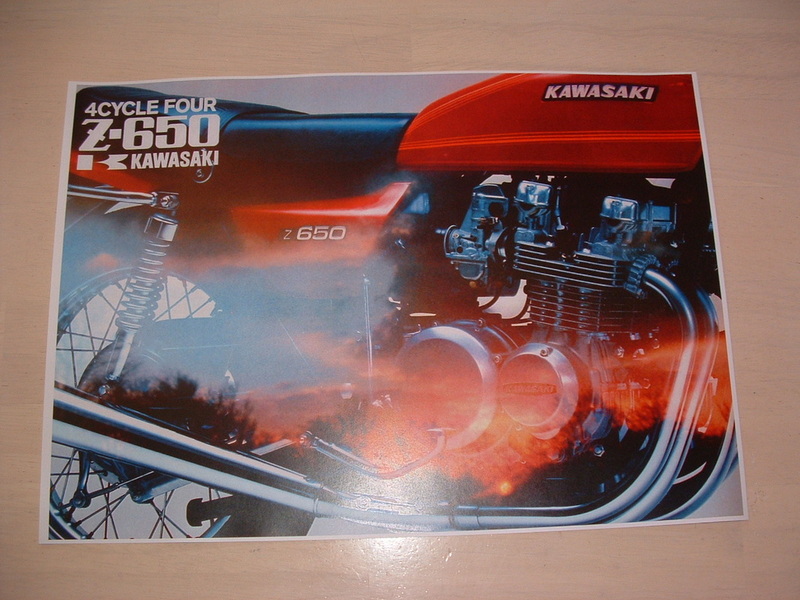 A 1978 factory poster for Japanese Dealers - with a misty japanese woodland sunrise super imposed onto the bike. A tribute to the "Land Of The Rising Sun" perhaps?? Reproduced on high quality silk paper. Size is just below A3 paper. 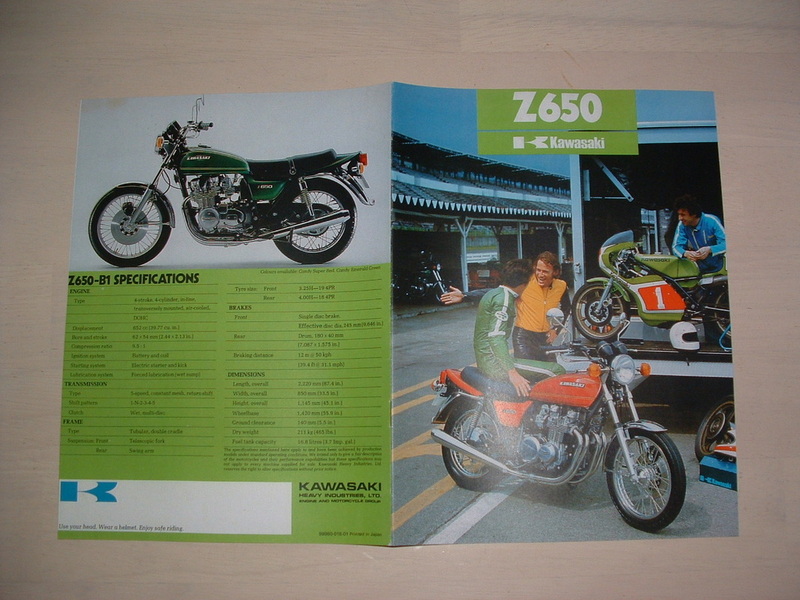 Within a year the success of the fiery new Z650 had created a thriving industry in after market parts such as engine bars, racks, four into one exhaust systems and alloy wheels.Kawasaki quickly released their own "Custom" versions. With double front discs and alloy wheels as part of the standard package they were very popular with those who could afford that "little bit extra". 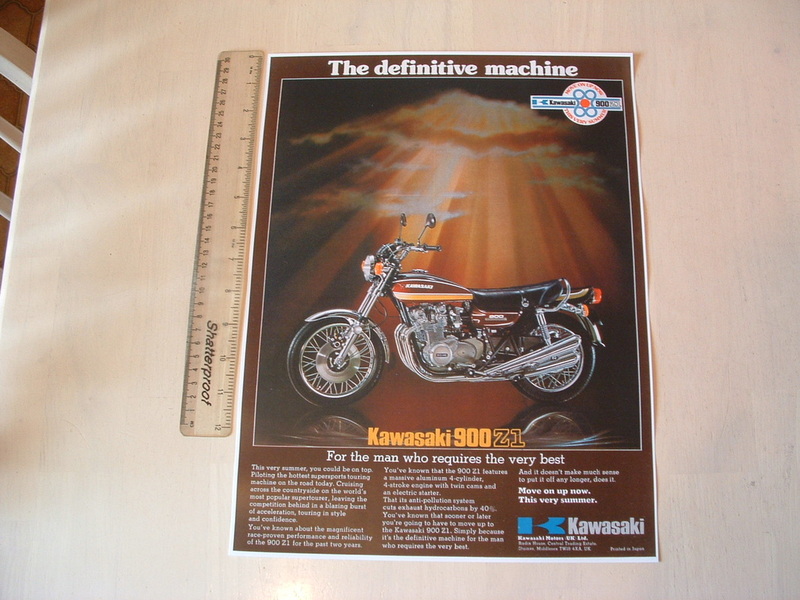 This reproduction brochure shows the 1978 C2 version of the machine. "We ran a 12 :74 quarter mile. Completely stock. We haven't heard of any 750 that has matched that time". Z650 C2 Competition - Be Quick! 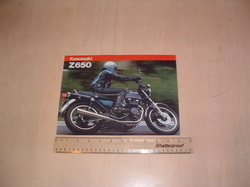 In 1978 Kawasaki UK promoted sales with a free colour matched helmet for Z650C buyers. 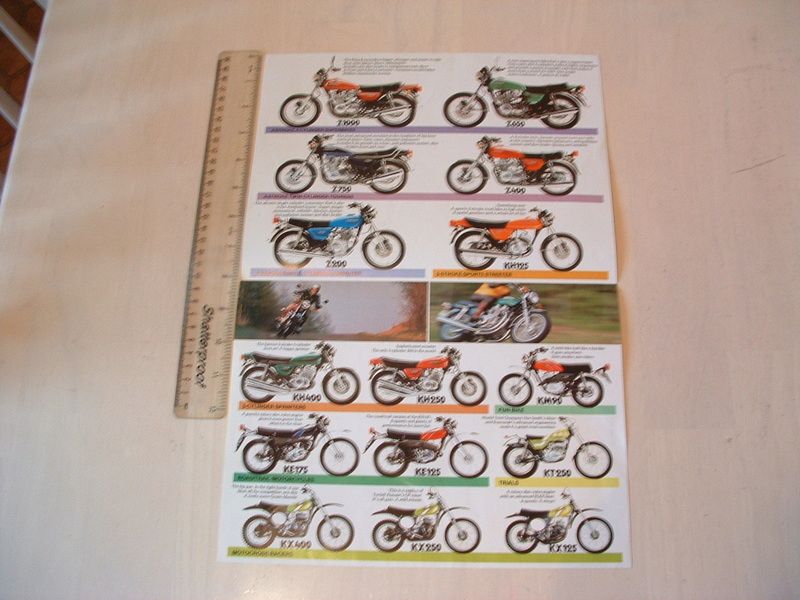 There was a spot the difference competition between the standard and custom versions - with five winners recieving brand new bikes. The first 650 correct entrants also got a 650 Custom T Shirt. 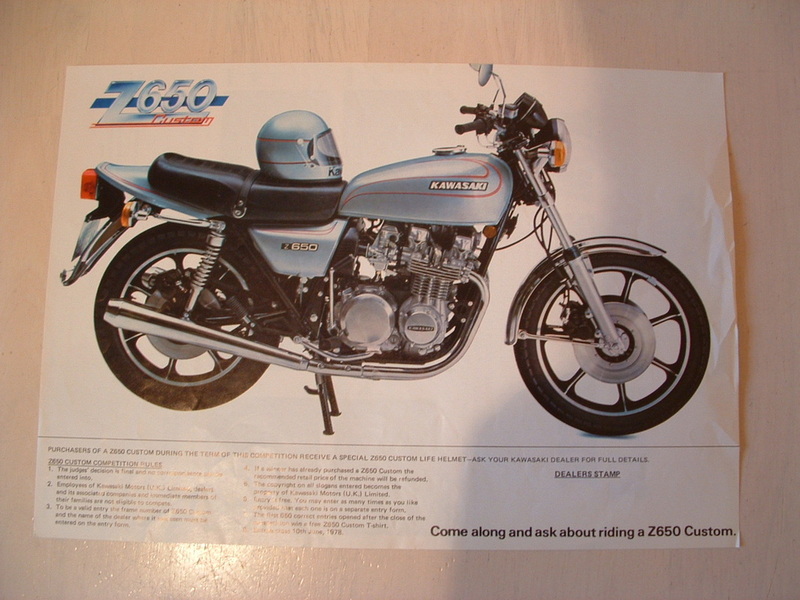 By 1980 production of the F series Z650s, which were to be the last of the range, had started. This reproduction F1 UK brochure shows the last Z650 to come with Mikuni slide Carbs and an unpainted alloy engine. Other features to appear for the last time were round indicators & the trademark tapered rear silencers. Later bikes had a straight cut end to the silencer. 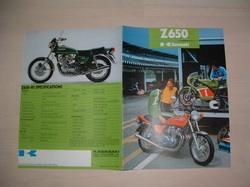 1980 Z650 F2 brochure showing new technical details. 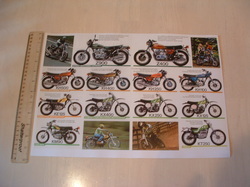 A great rebuild reference picture or an ideal addition to your bike history files. 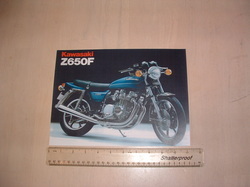 The F2 model was very different, using many Z750 components. 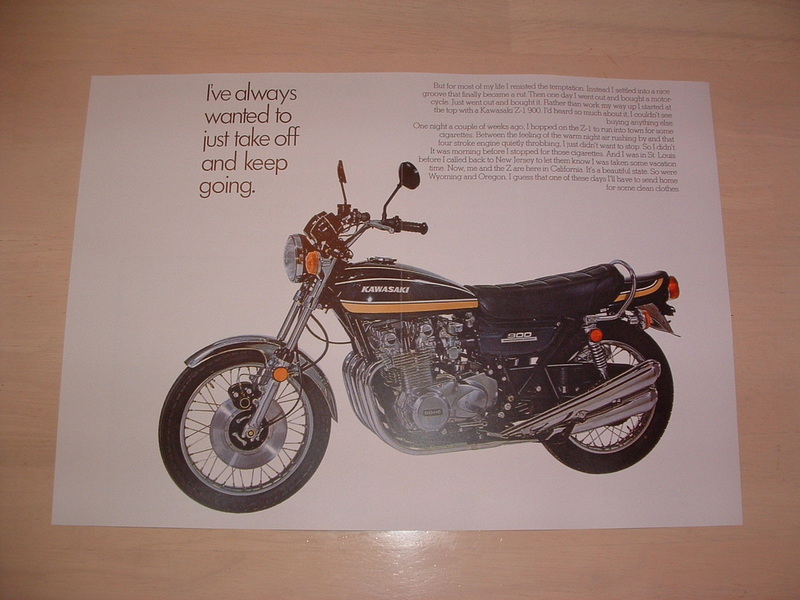 Square indicators, a grab rail, no kick start and Z750 instruments and front end all marked the end of an era. CDI ignition was now standard. Here is the UK F2 brochure action shot. You can see the new square cut silencers and black painted engine for the first time. 1981 Z650 F2 brochure showing technical details. 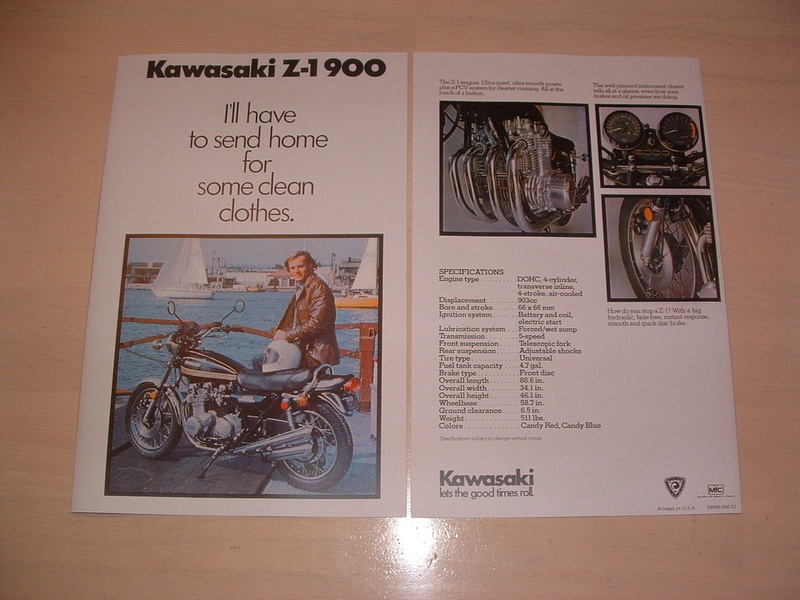 The 1982 F3 model was virtually the last in the range, and final changes included a move to CV carbs with a revised airbox borrowed from the Z750. European models sported black plastic mirrors for the first time. 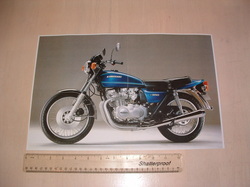 Front fenders now became body coloured - in line with the GPZ range which was taking over this segment of the market. 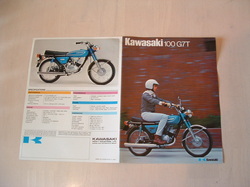 Here is the action cover shot from a 1982 UK brochure. 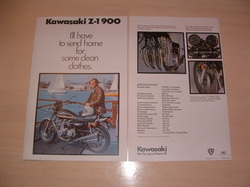 1982 Z 650 F3 brochure showing technical details. 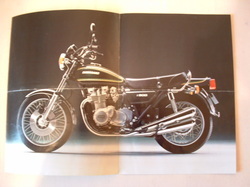 The Z1 and Z900 had faced increased competition from Laverda and others trying to steal the crown from the "King of Bikes" The Queen celebrated her Silver Jubilee in 1977, Triumph produced a special edition Bonneville - and Kawasaki produced the revised and improved Z1000 A1. Even Prince Charles was pictured trying one at the show. New quieter four into two silencers, a rear disc brake and thicker engine cases to reduce noise and vibration were just some of the changes. The King was back!! 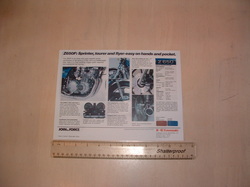 The picture above features the front and back covers and in this shot you can see the centre spread image. 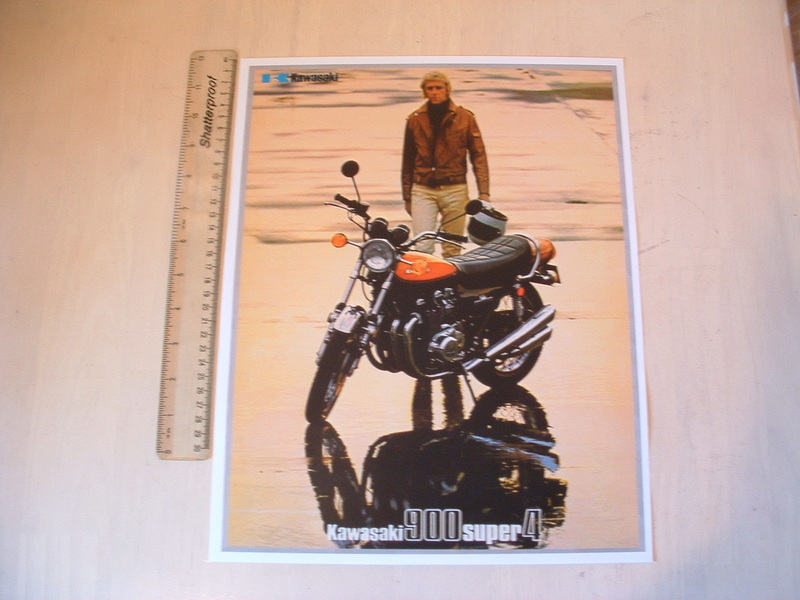 It would make a great rebuild reference picture or poster for your den or garage. 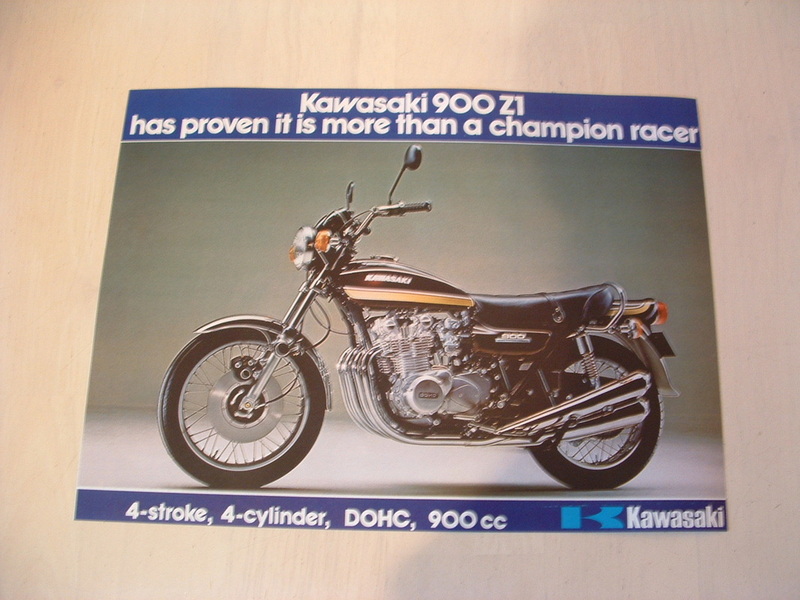 An ideal addition to your bike history files. 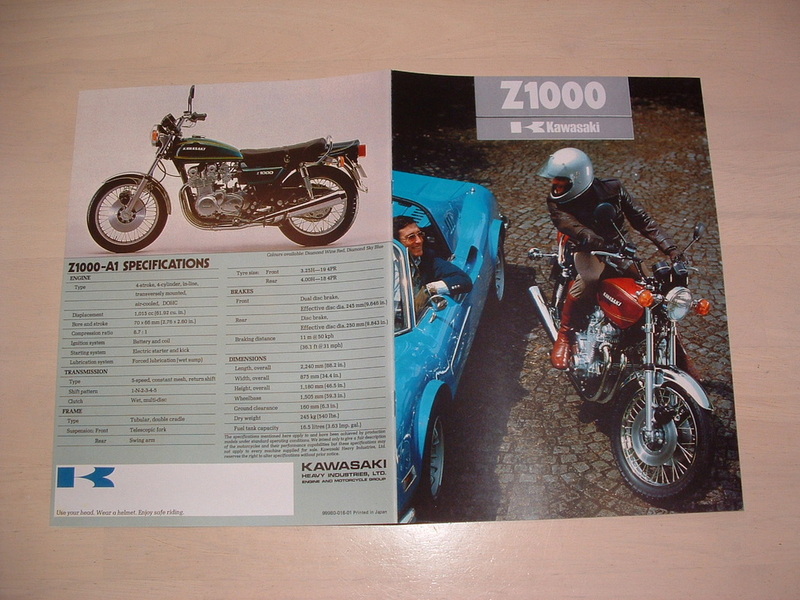 The Z1000 A2 for 1978 echoed changes to the Z650. A revised triangular master cylinder was adopted - the petrol tap was changed to a vacuum operated design - and the brake calipers were moved to behind the forks. The rear frame was further strengthened and an extra set of roller bearings added to the swinging arm - all designed to improve handling and comfort. 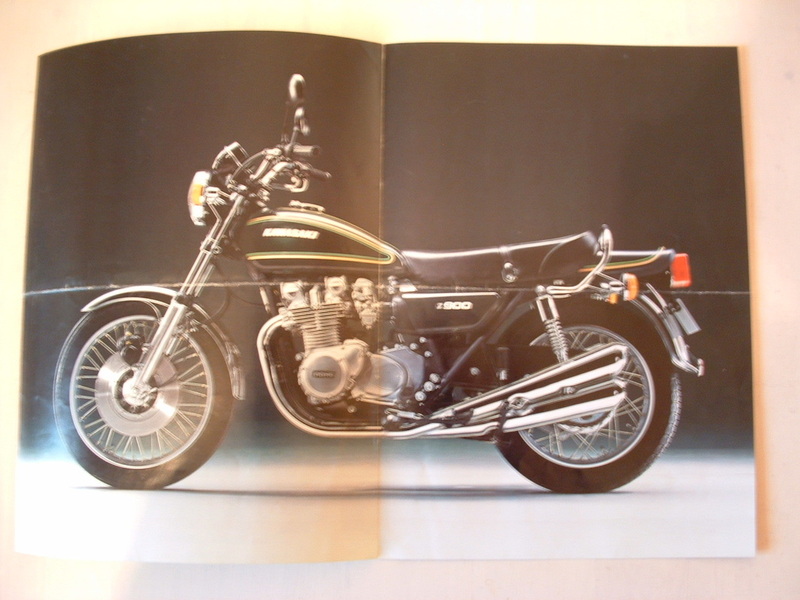 By the late 1970s monster 6 cylinder CBX & Z1300s were about to take over as ultimate sports machines & the next Z1000 would be a brand new design. see the centre spread image.